Hub of Joys is a modern hostel that provides everything that a backpacker could want and need. Hub of Joys 's location is near long beach only 300 metres, the sea accommodation from budget dorms to private rooms as shown. The area is popular for horseback riding and snorkeling. The hostel also provides bike rental. Klong Nin Beach is 2.4 km from Hub of Joys, and Pra Ae Beach is 3.1 km away. 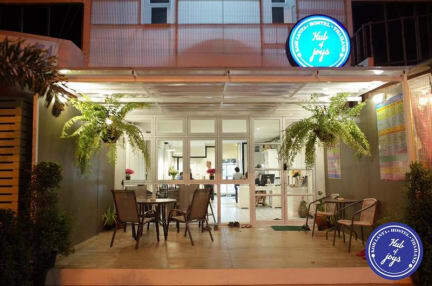 The nearest airport is Krabi Airport, 57.9 km from Hub of Joys Hostel. Amazing hostel! The staff is LOVELY and extremely caring. The hostel is very clean, comfortable beds with air condition. Breakfast is included and you get free snacks all day. Friendly atmosphere, great hostel to relax.5 min walk from the beach. Highly recommend!!! nos recibieron ayudandonos con las maletas, y ofreciendo jugo de naranja. Cada persona trabajando en este hostal es maravillosamente amable y llena de sonrisas. el desayuno es fantastico!!! hace dificil pensar que de hecho estaba incluido por que es completisimo. Recomiendo mucho que te hospedes en este lugar te trataran como un rey!